INDUSTRY.co.id - Jakarta - President Joko Widodo admitted to choosing senior politician of Golkar Party Idrus Marham as Minister of Social Affairs (Mensos) to replace Khofifah Indar Parawansa because he felt fit. "Consideration? 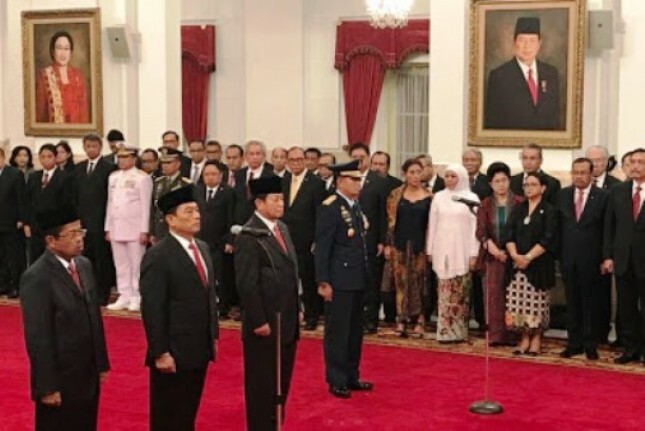 Yes because it is suitable, it fits their Pak Idrus.Later asked to Mr. Idrus directly," said President Joko Widodo (Jokowi) after the inauguration of state officials at the State Palace Jakarta, Wednesday (17/3/2018). He said people need to really understand and understand the conditions in the field to take over the post of Minister of Social Affairs. Especially that the affairs in the Ministry of Social Affairs, said the President, at this time a lot. "Once again the Ministry of Social Affairs is a lot, like now PKH PKH jumps from six million to ten million, so the preparation of co-chairs is a big job, not an easy job, then the distribution of rice is now partly moved to non- "The field needs a handling that is not easy," he said. Social Minister Replacement itself, according to Jokowi, as well as to provide an opportunity to Khofifah Indar Parawansa more concentrated in his nomination as Governor of East Java. "So let me concentrate in East Java so in the Ministry of Social Affairs there must also be a total handle because of our work a lot in this Ministry of Social Affairs, both in the form of distribution of rice, literature, business PKH, and so many other social affairs that must be quickly replaced ," he said. While related to the issue of dual positions in which Idrus currently serves as Secretary General in Golkar Party, the President does not want to interfere in the internal affairs of the party. "The matter in Golkar ask Pak Airlangga (Ketum Golkar) because the process in Golkar itself is not finished yet, so if the process is not finished please do not ask first," he said.